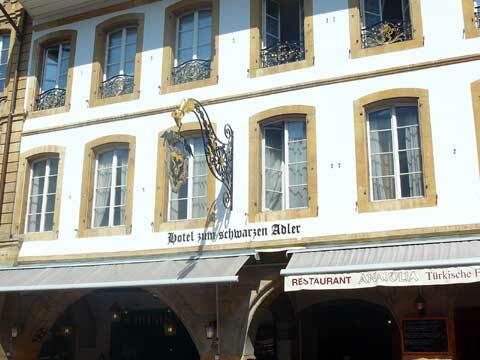 Completely renovated in 2012, the Hotel Adler in Murten / Morat is part of the history of the city as it was first mentionned in the year 1396. Goethe and Casanova have been guest in this hotel. Today, all rooms offer modern confort and have been individually decorated by an artist. The hotel offers a family suite, five junior suites, three double rooms and four single rooms. All suite have a small kitchen. Various restaurants are located on the main floor of the hotel. Please note that this hotel doesn’t provide any breakfast. In their reviews, guests of the hotel indicate that they liked the clean rooms and the central location of the Hotel Adler in Murten / Morat. The Adler Hotel is nicely located in Murte and the room decoration is interesting. However, the service does not live up to modern standards.